Education Preview Day Friday, Oct. 26, 2018 | 8:15 a.m. to 3:30 p.m.
You'll have the opportunity to get to know the professors who will be teaching your classes—as well as current students in Northwestern's education programs—during breakout sessions, a student panel and lunch. You'll also be able to observe an education class, attend a teaching lab, and schedule appointments to find out more about your co-curricular interests. Special activities are planned for both future elementary and secondary teachers. You'll also learn about teaching licenses, endorsements, badges and field hours. We want your day with us to be the start of discovering your gifts and God's calling for your life. Why study education at NWC? 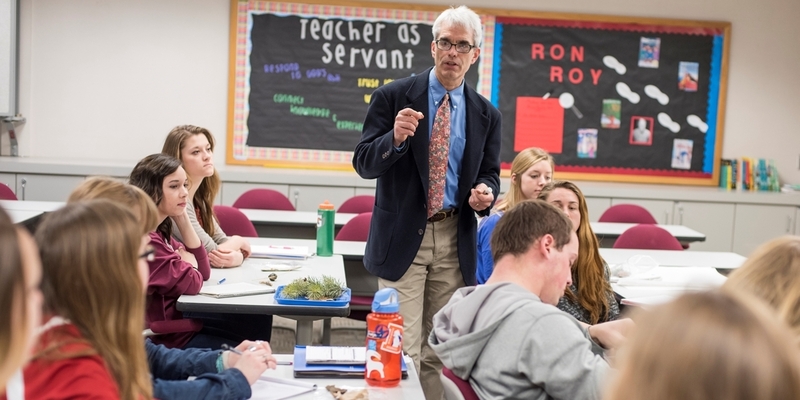 Northwestern's education department is 1 of only 4 in Iowa accredited by CAEP (Council for the Accreditation of Educator Preparation), the nation's leading accrediting agency for teacher education. Our elementary education program has earned national recognition from ACEI—the Association for Childhood Education International. Elementary education majors can choose from 15 endorsements, including all subject areas as well as coaching, reading, special education and teaching English as a second language (TESL). Students seeking certification as a secondary education teacher can choose from among 13 endorsements, including coaching, special education and TESL. Nearly every education class includes a field experience with students in area K-12 schools or public libraries, so that by the time you are given a student -teaching assignment, you’ll already have spent 100 hours in educational settings. If you decide to further your education, Northwestern also offers an online Master of Education degree that can be completed in two years or less.